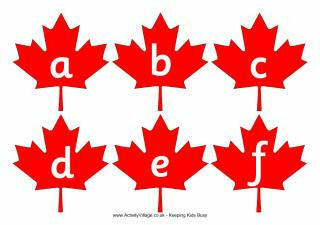 We have a growing collection of Canada Day printables for you to enjoy with your family here at Activity Village, including everything from Canadian flags to print, through cards, printable alphabets and acrostic poem printables! Here's a photographic poster of the Canadian flag, flying against a brilliant blue sky. Just for fun, print out these Happy Canada Day bookmarks to hand out this year! This Happy Canada Day bunting is designed to make an impact - while using up as little printer ink as possible! Cut the edges off this fun Happy Canada Day colouring design to use it as a placemat - or just as a straight-up colouring page. We have a poster too. We thought it might be fun to have a Happy Canada Day poster to print out for display - but it also makes a fun placemat for your Canada Day picnics and meals! We have a colouring version, too. Here is a lovely, cheerful but very smart Canadian Mountie to grace your displays or decorate your walls!